This up-to-date and practical teaching resource makes the theories and principles of construction safety and health useful in a real-world setting, and integrates up-to-the-minute research throughout. 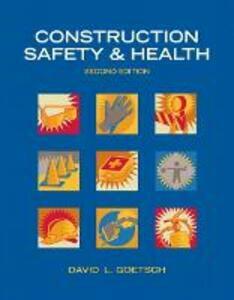 Direct and straightforward, CONSTRUCTION SAFETY & HEALTH, 2/e focuses on the specific needs of modern construction professionals and on the requirements set forth by OSHA and other regulators., Each chapter focuses on one key area of concern, and chapters are sequenced to reflect the typical organization of college-level construction safety and health courses. Extensive updates include: LEED accreditation; effects of design on construction safety; new material on ergonomics, human factors, and behavior-based safety; and much more. Every chapter includes review questions, listings of key terms and concepts, and activities promoting critical thinking, discussion, and hands-on application. Student resources are available on the companion website www.pearsonhighered.com/careersresources/.